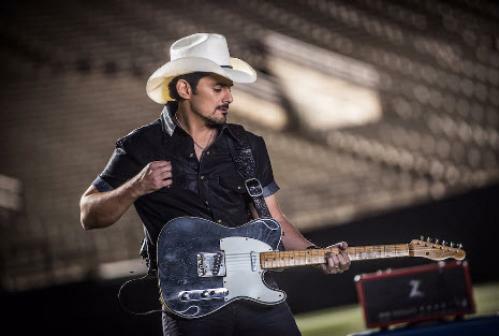 Country music superstar Brad Paisley has announced the continuation of his highly successful Weekend Warrior World Tour with dates added in 2018. The 26-date tour will kick-off on January 25 in Los Angeles at STAPLES Center and extend through April, with more dates to be added. Special guests will be Broken Bow Records Platinum-selling artist Dustin Lynch, RED BOW Records hit-maker Chase Bryant and fast-rising star and multi-instrumentalist Lindsay Ell. Brad Paisley is a consummate singer, songwriter, guitarist and entertainer whose talents have earned him numerous awards, including three GRAMMYs, two American Music Awards, 14 Academy of Country Music Awards and 14 Country Music Association Awards (including Entertainer of the Year), among many others. He has been a proud member of the Grand Ole Opry since 2001. Paisley has written 21 of his 24 #1 hits including his most recent smash, “Today.” The song resonated with fans around the globe with the music video garnering over 43 million views, so far. “Heaven South” is his current single from his 11th studio album, LOVE AND WAR, which was released April 21. It is his 9th consecutive studio album to debut #1 on Billboard’s Top Country Albums chart. On April 28 LOVE AND WAR was released as country music’s first ever visual album for a limited time exclusively on Apple Music and now is available on VEVO. Paisley contributed two instrumental tracks to the Disney∙Pixar movie Cars 3, which hit theaters on June 16. He also has a song, “Stubborn Angels,” in the movie Same Kind of Different as Me, in theaters now. Paisley has partnered with Sarah Cannon, the Cancer Institute of HCA Healthcare, and Sony Music Nashville, by launching 2017 Band Against Cancer. The campaign will spread the word of community-based treatment, options and support. Sarah Cannon has adopted Paisley’s #1 hit “Today” as the campaign’s 2017 theme song. Paisley has partnered with Boot Barn® and developed an exclusive line of jeans, hats, T-shirts, jewelry, belts and woven shirts called Moonshine Spirit by Brad Paisley. A 2016 CMT Music Award and multiple Canadian Country Music Award nominee, Ell exhilarated audiences from coast-to-coast as part of the 2016 CMT Next Women of Country Tour and Brad Paisley’s 2017 WEEKEND WARRIOR WORLD TOUR. Ell’s debut album The Project released on August 11 and debuted at No. 1 on the Nielsen Soundscan Current Country Albums Chart. For more information visit: http://www.LindsayEll.com.